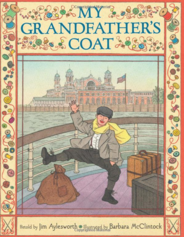 This warmly told and splendidly illustrated tale of a coat repurposed and refashioned over decades of use celebrates the determination, resourcefulness, and ingenuity that are bedrock values for so many immigrant families. Here's hoping copies of this book become as well worn as Grandfather's blue coat itself. 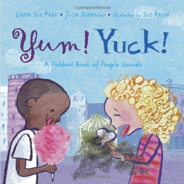 At a busy street market, kids eating ice cream exclaim, "Yum!" in English, "Geshmak!" in Yiddish, and "Nam-nam!" in Danish. But disaster strikes when a little dog overturns a spice cart, showering pepper on everyone's ice cream. Will the kids end up crying, "Hai hai," or cheering, "Yupi!?" Energetic art and a lift-the-flap feature make exploring languages fun. Vasya Kandinsky was a proper little boy: he studied math and history, he practiced the piano, he sat up straight and was perfectly polite. And when his family sent him to art classes, they expected him to paint pretty houses and flowers—like a proper artist. 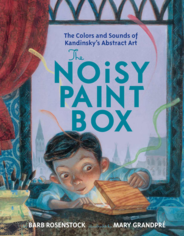 But as Vasya opened his paint box and began mixing the reds, the yellows, the blues, he heard a strange sound—the swirling colors trilled like an orchestra tuning up for a symphony! And as he grew older, he continued to hear brilliant colors singing and see vibrant sounds dancing. But was Vasya brave enough to put aside his proper still lifes and portraits and paint . . . music? In this exuberant celebration of creativity, Barb Rosenstock and Mary GrandPré tell the fascinating story of Vasily Kandinsky, one of the very first painters of abstract art. Throughout his life, Kandinsky experienced colors as sounds, and sounds as colors—and bold, groundbreaking works burst forth from his noisy paint box. 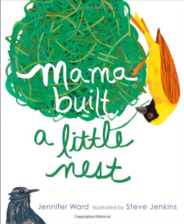 A delightful exploration of the incredibly variety of nests birds build for their babies. There are so many different kinds of birds—and those birds build so many different kinds of nests to keep their babies cozy. 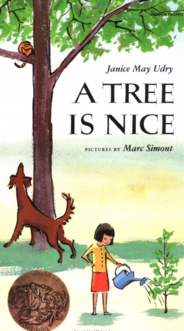 With playful, bouncy rhyme, Jennifer Ward explores nests large and small, silky and cottony, muddy and twiggy—and all the birds that call them home! Who could care for a bear? 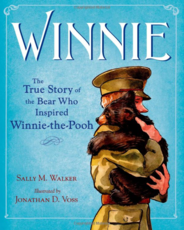 Sally Walker's heartwarming story, paired with Jonathan Voss's evocative illustrations, brings to life the story of the real bear who inspired Winnie the Pooh. But who could care for the bear when Harry had to go to the battleground in France? Harry found just the right place for Winnie while he was away―the London Zoo. There a little boy named Christopher Robin came along and played with Winnie―he could care for this bear too! Harry named the bear Winnie, short for Winnipeg, his company's home town, and he brought her along to the training camp in England. Winnie followed Harry everywhere and slept under his cot every night. Before long, she became the regiment's much-loved mascot. When Harry Colebourn saw a baby bear for sale at the train station, he knew he could care for it. Harry was a veterinarian. But he was also a soldier in training for World War I.